I always get a little giddy when a charming little book like this lands on the mat. I've said it before. A pretty book invites you in. A beautifully styled book with lots of colourful pictures entices me to try its recipes much more than something that doesn't get the imagination racing. The shots in this book remind me of a parisian patisserie; perfect. However, stop right there if you think that everything in the book is beyond the muster of your average baker. Here it ticks another box... something for every level of skill. Amazing stacked tiers painstakingly covered in sugar-paste with an eye for detail that satisfies even the most rampant case of OCD are mixed with simple biscuits, vibrant cake pops and pastel meringues. 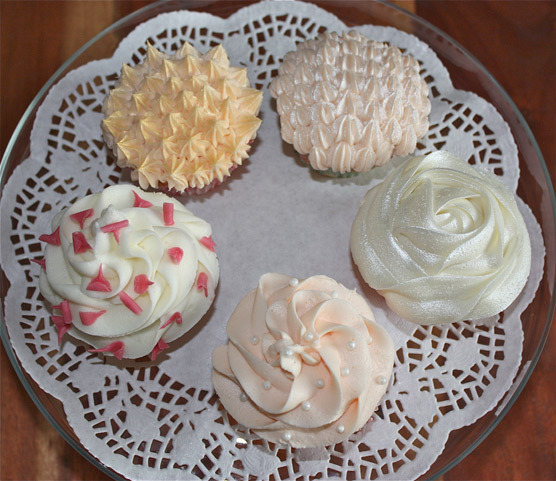 Sweet tables are the latest craze to sweep America thanks to the likes of Martha Stewart and Amy Atlas. Even over here, the sweet buffet is becoming a staple at fetes and weddings. A feast for the eyes and the belly. Everything is covered. How to get your cakes level before embarking upon icing, how to use simple piping techniques to create a show-stopper, and recipes which make the magic so enticing. I was inspired to make some chic cupcakes, after all I had spent the previous day making luminous monsters... Balance needed to be restored. Urgently. 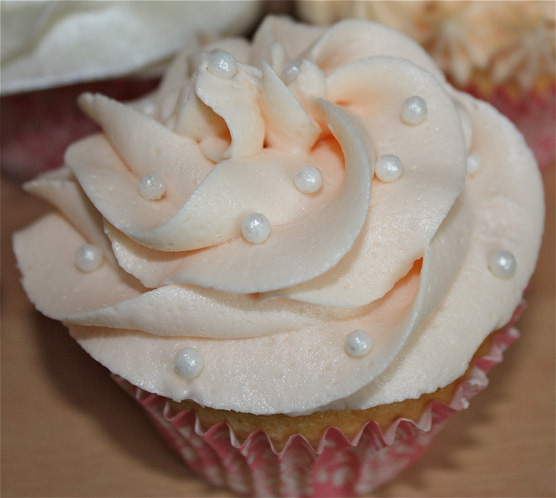 Sparkle, lustre, roses, pearls and sweeping swirls were my inspiration for this batch. Not an eyeball in sight... Not a trace of neon. To make the cupcakes above I used lots of different techniques and decorations. 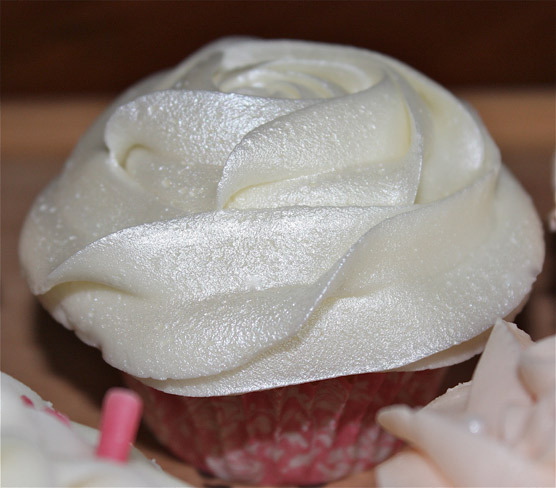 Pearl Rose Cupcake - to create this I used a Wilton 1B nozzle and a quick spritz of Dr Oetker silver decoration spray. Lustre Quilted Cupcake and Gilded Spires Cupcake - these were both made using a Wilton 21 nozzle in short sharp bursts but in different directions, and covered in gold and silver Dr Oetker sprays. 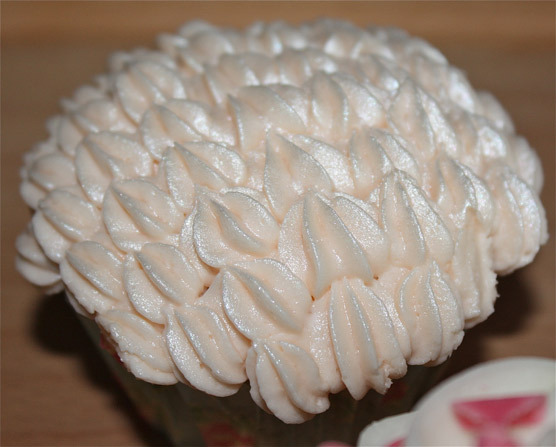 Pearl and Swirl Cupcake - this is a really simple swirl of buttercream using a Wilton 1M and Dr Oetker pearl dragees. Confetti Cupcake - again, really simple using a Wilton 1M but this time with strawberry chocolate 'confetti' curls from The Chocolate Cafe in Ramsbottom. I used the book's simple vanilla cupcake recipe and one quantity of their vanilla buttercream dyed baby blue and petal pink using Dr Oetker food colour gels. 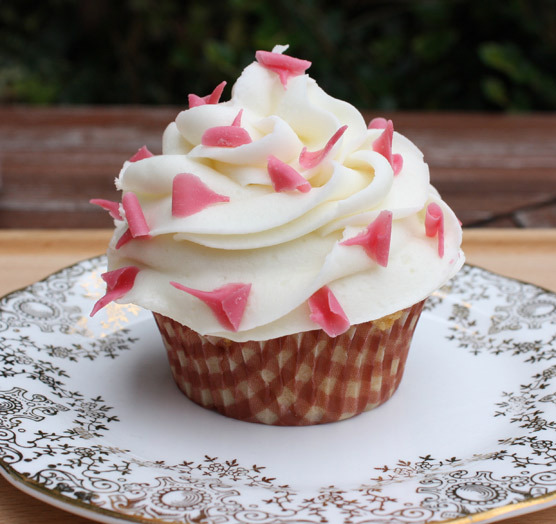 The buttercream had a beautifully light consistency which I found piped well. I did however run out because I had been using so much per cake! Luckily I had a batch of Renshaw 'Snip and Swirl' in the cupboard for just such an emergency! Although this can be used straight from the bag, I popped it into a piping bag with a nozzle and off I trot. Buy this book if you love to make a masterpiece, need inspiration, love 'small and pretty', want a challenge or indeed just fancy a beautiful coffee table book. Buy the book at RUCraft for just £11.24. Disclaimer: I reviewed this book because it's excruciatingly beautiful. I received no payment from the publisher. Read more about the author at David & Charles. None of the companies listed above paid me for this post. Both Renshaw and Dr Oetker ave sent me samples to test out as part of my normal baking. I was delighted with the results from all products used. I love all the fine detail put into the decorating of the muffins. Beautiful! Stunning! I've seen that silver spray but didn't realise the effect would be so striking, it looks like silky smooth ribbons atop a cake!